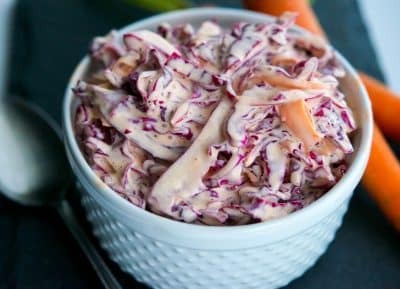 This Sriracha Red Cabbage Slaw is deliciously creamy with a little bit of heat. 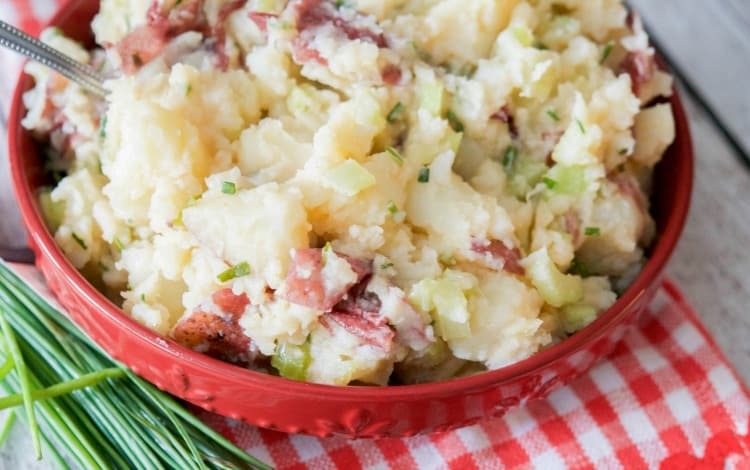 The perfect addition to your summer salad rotation. I’ll admit it. I’m a huge coleslaw snob. I guess it’s because I’m not overly fond of cabbage; especially when it’s served warm. 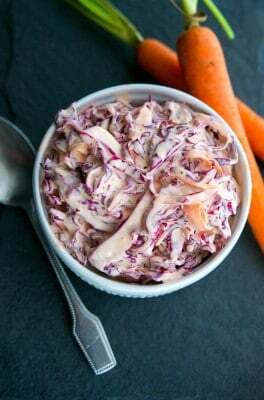 However, MANY years ago, while I was working at a small, family Italian deli in my college days I learned how to make this Homemade Coleslaw using white or Napa cabbage. 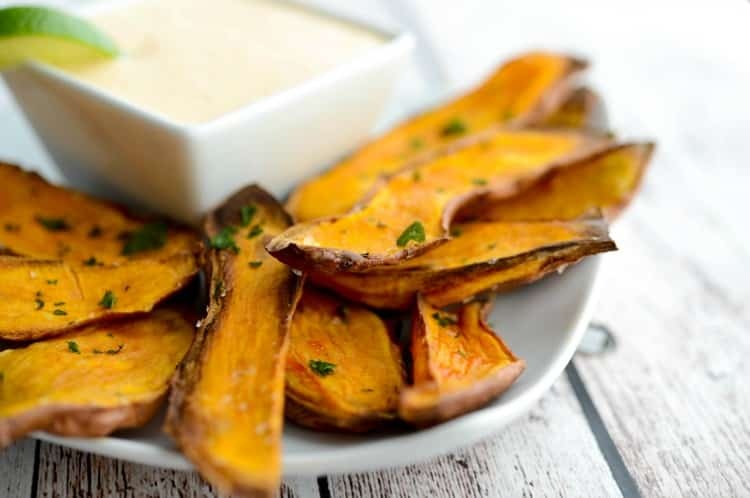 The recipe was simple; which is always a plus, and it was creamy every time. This was the only way I would eat cabbage or coleslaw…ever. That is until I tried this new Sriracha Red Cabbage Slaw. 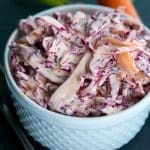 I wanted to update my favorite coleslaw recipe to create something new and wonderful and decided to give it a little kick by adding some Sriracha and fresh lime juice. OH. MY. GOODNESS. Just look at that how creamy it looks! 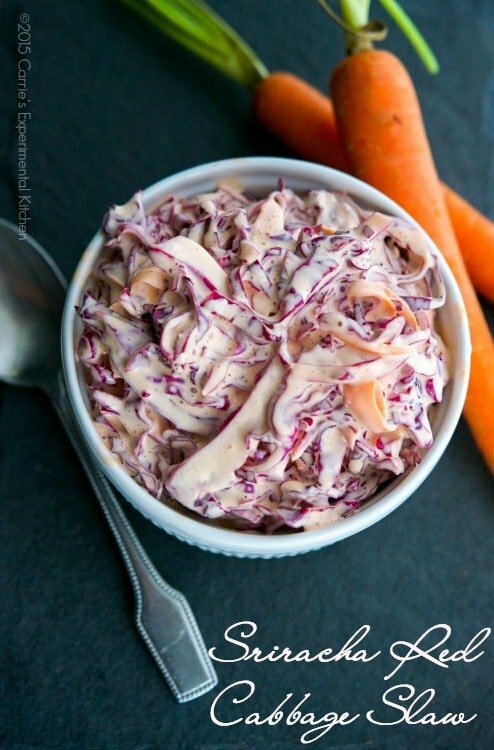 I prefer my coleslaw on the creamy side and the longer it sits, the creamier it gets. You achieve that by slicing the cabbage super thin using a very sharp knife or an electric slicer. Since I was only making this for the four of us, I opted for the knife. Start by cutting your cabbage in half, then cut out the core on both halves by making angled cuts alongside of the core (like a triangle). Take out the core and rinse both halves under cold water to remove any excess dirt. Allow cabbage to drain on a paper towel to remove excess moisture. Grab a cutting board; then cut each half in half again and hold upright so that it’s level on the board. Take a sharp knife and slowly start “slicing” the cabbage as this as you can get it. I like mine 1/8″ – 1/4″ thick. Place the cabbage in a large bowl and add the shaved carrots. To shave the carrots, use a vegetable peeler to remove the first layer of skin; then keep shaving the rest. In a small separate bowl, combine the mayonnaise (I only use Hellmann’s; especially for my salads), Sriracha, fresh lime juice, sugar and salt. Whisk until creamy; then pour over the cabbage. Mix well with clean hands (I find it easier to do it this way than with a spoon); then place in a sealed bowl or container in the refrigerator for at least 6 hours (I prefer overnight). This Sriracha Red Cabbage Slaw is a MUST-HAVE on your summer bbq salad rotation. It only takes about 15-20 minutes to put together and contains 5 ingredients. Simple right? I would suggest that you start out with less Sriracha than you think you’ll need at first because as it sits, the flavor intensifies. Trust me. I started out with 1 tablespoon; then tasted it before it had time to sit and decided to add another tablespoon. When I went to go try it the next day, it really had a kick, but we ate it anyway and it was delicious! Just use it sparingly at first if you have a sensitive pallet. You can always add more. ~Enjoy! Grab a cutting board; then cut each half in half again and hold upright so that it's level on the board. Take a sharp knife and slowly start "slicing" the cabbage as this as you can get it. I like mine 1/8" - 1/4" thick. Place the cabbage in a large bowl and add the shaved carrots. 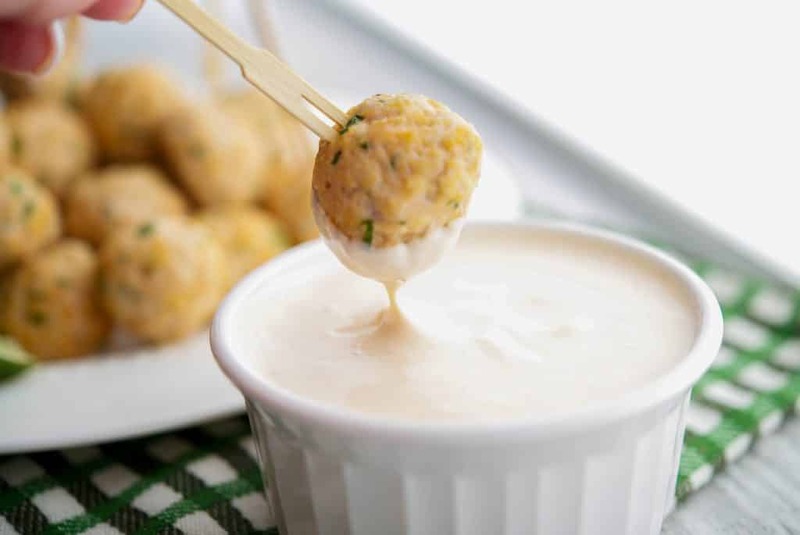 In a small separate bowl, combine the mayonnaise, Sriracha, fresh lime juice, sugar and salt. Whisk until creamy; then pour over the cabbage. The Sriracha red cabbage slaw….amazing!!!!! Making this again for my daughters end of the school year party!